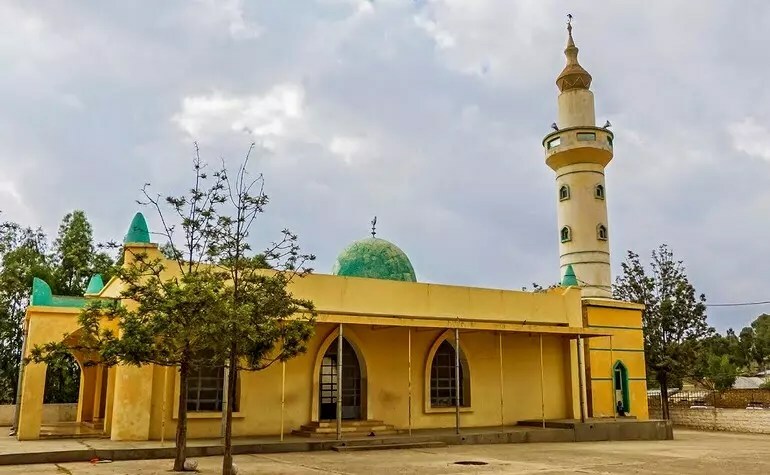 This masjid (mosque) is located in the town of Negash in northern Ethiopia and is around the area where a just ruler, Ashama ibn Abjar (King Negus) lived at the time of the Prophet (ﷺ). He gave refuge to two groups of Sahabah, companions of the Prophet (ﷺ) who migrated there on account of the persecution of the Quraysh in the early days of Islam. After much suffering at the hands of the Quraysh in Makkah, the Prophet (ﷺ) commanded a small group of Muslims to make Hijrah (migration) to a safe place in the country of Abyssinia. (what is now Ethiopia). Abyssinia at that time was ruled by a Christian King (who later on embraced Islam), famous for his mercy and equity, whose title was Negus. They were sure to receive protection and worship and live in peace there. In Rajab of the fifth year of the Mission (614-615 CE), the first group emigrated to Abyssinia. The group comprised about twelve men and five women and included Uthman (may Allah be pleased with him) and his wife Ruqayyah (may Allah be pleased with her), the daughter of the Prophet (ﷺ). The Quraysh pursued them to the port of Shuaibah by the Red Sea to capture them, but their vessels had left the shore. When the group reached Abyssinia, they heard the rumour that the whole tribe of the Quraysh had accepted Islam. They were naturally very much pleased at the news and returned to their country. On approaching Makkah, they learnt that the rumour was false and the persecutions were going on unabated. Some of them decided to return to Abyssinia and the rest entered Makkah, seeking the protection of a few influential people. This is known as the first migration to Abyssinia. Later on, a bigger group of around 83 men and 18 women emigrated to Abyssinia led by Jafar bin Abu Talib (may Allah be pleased with him), the cousin of the Prophet (ﷺ). This is called the second emigration to that country and some Sahabah took part in both the migrations. The Qureysh did not like the emigrations, and the thought of peace enjoyed by the fugitives gave them no rest. They sent a delegation to Abyssinia led by Amr bin Aas (a non Muslim at the time) with handsome presents for the king, his courtiers and the clergy. The delegation first met the chiefs and the priests and, by offering them presents, succeeded in winning the court officials to their side. When Jafar (may Allah be pleased with him) concluded his speech, the king asked him, “Let us hear something of the Qur’an that your Prophet (ﷺ) has taught you.“ Jafar (may Allah be pleased with him) recited a few verses from the beginning of Surah ‘Maryam’, which touched the hearts of the king and the priestly class so much that tears flowed down their cheeks and wetted their beards. The king remarked, “By Allah, these words and the words revealed to Musa (upon him be peace) are the rays of one and the same light,” and he told the Quraysh embassy that he would by no means hand over the refugees to them. Then, disappointed and disgraced, they held a counsel. One of them said, “I have hit upon a plan that is sure to draw the king’s wrath upon their heads.“Although the others did not agree to such a drastic step (for after all they were their own flesh and blood) he would not listen. The next day, they excited the king by telling him that those heretics denounced Isa (upon him be peace) [Jesus] and did not believe in his Divinity. The Muslims were again summoned to the court. They were much more distressed this time. When the king inquired about their belief in Isa (upon him be peace), they said: “We believe in what Allah has revealed about him to our Prophet (ﷺ), i.e. he is a servant and Prophet of Allah, and is His word, which He conveyed to the virgin and pure Maryam.“ Negus said: “Isa (upon him be peace) himself does not say anything beyond that.“ The priests then began to murmur in protest, but the king would not listen to them. He returned to the delegation the presents they had brought for him, and said to the Muslims, “Go and live in peace. If anybody ill-treats you, he will have to pay heavily for it.“ A royal declaration was also issued to that effect. 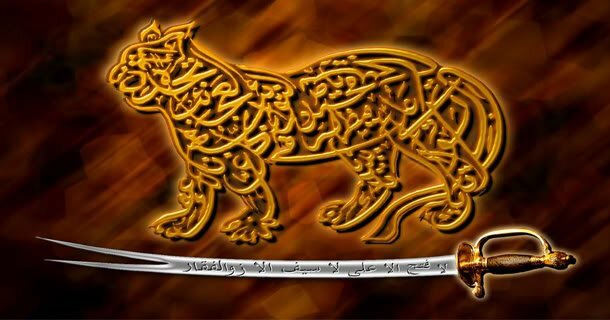 This enhanced the prestige of the Muslims in the country, and the Quraysh delegation had to return crestfallen. 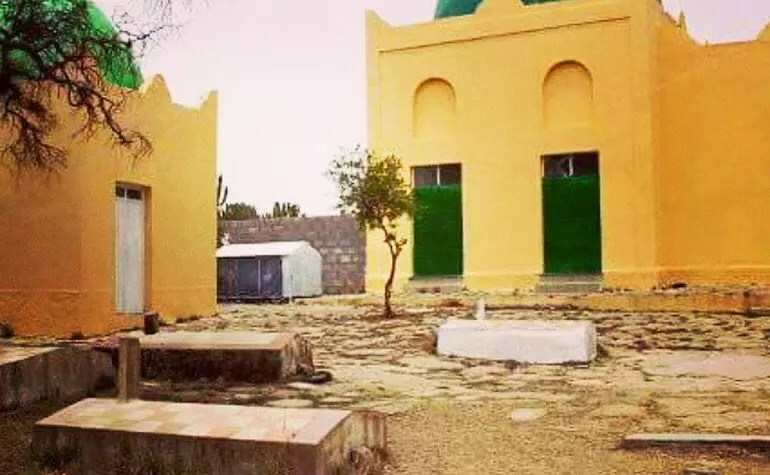 King Negus is buried within the masjid compound as are several Sahabah who died there. Negash is, therefore, not only the burial place of the world’s first Muslim king but also the resting place of the bodies of the early Muslims of the world who were denied a home to be buried in because of their beliefs. The Muslims finally returned from Abyssinia in 7 A.H. but to Madinah and not Makkah. “In the Name of Allah, the Most Beneficent, the Most Merciful. From Muhammad the Messenger of Allah to Negus, king of Abyssinia (Ethiopia). I entertain Allah’s praise, there is no god but He, the Sovereign, the Holy, the Source of peace, the Giver of peace, the Guardian of faith, the Preserver of safety. I bear witness that Jesus, the son of Mary, is the spirit of Allah and His Word which He cast into Mary, the virgin, the good, the pure, so that she conceived Jesus. Allah created him from His spirit and His breathing as He created Adam by His Hand. I call you to Allah Alone with no associate and to His obedience and to follow me and to believe in that which came to me, for I am the Messenger of Allah. I invite you and your men to Allah, the Glorious, the All-Mighty. I hereby bear witness that I have communicated my message and advice. I invite you to listen and accept my advice. From Negus Ashama to Muhammad, the Messenger of Allah. •An Well Famous Christian King Of Ethiopia Became An Muslim After the Letter of RasulAllah Sallallahu Allaihiyi Wassallam• • The letter to the Christian king of Ethiopia Negus (or al-Najashi) is an important example of the Muslims’ attitude toward Christians. Following Muhammad’s (may Allah bless him and grant him peace) letter and his discussions with the Muslim leader and the leader of the Makkan delegation sent to take them back to Makkah, King Najashi proclaimed that he would protect all Muslims who sought refuge in his country. The letter said: ” I praise Allah to you, except Whom there is none to be worshipped, the King, the Holy, the Peace, the Faithful, the Watcher, and I bear witness that Jesus, son of Mary, is the Spirit of Allah and His Word, Which He cast to Mary the virgin, the good, the pure, so that she conceived Jesus. Allah created him from His Spirit and His Breathing. I call you to Allah, the Unique without partner, and to His obedience, and to follow me and believe in that which came to me, for I am the Messenger of Allah … I invite you and your armies to Allah. I have accomplished my work and my admonition, so receive my advice. Peace upon all those that follow True Guidance.” Bismillah Al-jawab billahi at-taufeeq (the answer with Allah’s guidance) Yes, Al Najjashi (Negus-the king of Abyssinia (Ethiopia)) reverted to Islam during the life of the prophet (Sallallahu Alaihi Wasallam). Below, is an extract from Ar Raheequl Makhtum Pg. 221,222 (The sealed nectar-Biography of the noble prophet (Sallallahu Alaihi Wasallam): “Negus, king of Abyssinia (Ethiopia), his name was Ashama bin Al-Abjar, received the Prophet�s message, despatched by Amr bin Omaiyah Ad-Damari, which At-Tabari referred to, either late in the sixth year or early in the seventh year A.H. Deep scrutiny into the letter shows that it was not the one sent after Al-Hudaibiyah event. Wording of the letter rather indicates that it was sent to that king when Ja�far and his companions emigrated to Abyssinia (Ethiopia) during the Makkan period. One of its sentences read “I have despatched my cousin, Ja�far with a group of Muslims, to you. Do be generous towards them and give up haughtiness.” Al-Baihaqi, on the authority of Ibn Ishaq, gave the following narration of the Prophet�s letter sent to Negus: “This letter is sent from Muhammad, the Prophet to Negus Al-Ashama, the king of Abyssinia (Ethiopia). Peace be upon him who follows true guidance and believes in All�h and His Messenger. I bear witness that there is no god but All�h Alone with no associate, He has taken neither a wife nor a son, and that Muhammad is His slave and Messenger. I call you unto the fold of Islam; if you embrace Islam, you will find safety, “Say (O Muhammad [pbuh]): �O people of the Scripture (Jews and Christians), come to a word that is just between us and you, that we worship none but All�h, and that we associate no partners with Him, and that none of us shall take others as lords besides All�h.� Then, if they turn away, say: �Bear witness that we are Muslims.� ” [Al-Qur’an 3:64] Should you reject this invitation, then you will be held responsible for all the evils of the Christians of your people.” Dr. Hameedullah (Paris), a reliable verifier, has adduced a version of the above letter disclosed only a short time ago and identical to Ibn Al-Qaiyim�s narration. Dr. Hameedullah exerted painstaking effort and used all means of modern technology to verify the text of the letter, which reads as follows: “In the Name of All�h, the Most Beneficent, the Most Merciful. From Muhammad the Messenger of All�h to Negus, king of Abyssinia (Ethiopia). Peace be upon him who follows true guidance. Salutations, I entertain All�h�s praise, there is no god but He, the Sovereign, the Holy, the Source of peace, the Giver of peace, the Guardian of faith, the Preserver of safety. I bear witness that Jesus, the son of Mary, is the spirit of All�h and His Word which He cast into Mary, the virgin, the good, the pure, so that she conceived Jesus. All�h created him from His spirit and His breathing as He created Adam by His Hand. I call you to All�h Alone with no associate and to His obedience and to follow me and to believe in that which came to me, for I am the Messenger of All�h. I invite you and your men to All�h, the Glorious, the All-Mighty. I hereby bear witness that I have communicated my message and advice. I invite you to listen and accept my advice. 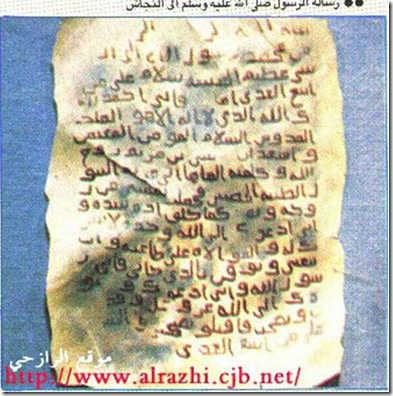 Peace be upon him who follows true guidance.”[Za’d Al-Ma’ad 3/60] The text of this letter is doubtlessly authentic, but to maintain that it was written after Al- Hudaibiyah event is still a question lacking in definite evidence. When �Amr bin Omaiyah Ad-Damari communicated the Apostolic letter to Negus, the latter took the parchment and placed it on his eye, descended to the floor, confessed his faith in Islam and wrote the following reply to the Prophet [pbuh]: “In the Name of All�h, the Most Beneficent, the Most Merciful. 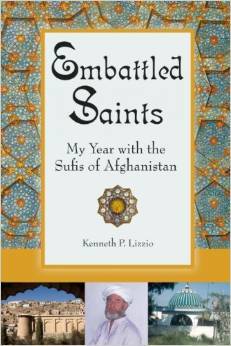 From Negus Ashama to Muhammad, the Messenger of All�h. Peace be upon you, O Messenger of All�h! and mercy and blessing from All�h beside Whom there is no god. I have received your letter in which you have mentioned about Jesus and by the Lord of heaven and earth, Jesus is not more than what you say. We fully acknowledge that with which you have been sent to us and we have entertained your cousin and his companions. I bear witness that you are the Messenger of All�h, true and confirming (those who have gone before you), I pledge to you through your cousin and surrender myself through him to the Lord of the worlds.”[Za’d Al-Ma’ad 3/61] The Prophet [pbuh] had asked Negus to send Ja�far and his companions, the emigrants to Abyssinia (Ethiopia), back home. They came back to see the Prophet [pbuh] in Khaibar. Negus later died in Rajab 9 A.H. shortly after Tabuk Ghazwa. The Prophet [pbuh] announced his death and observed prayer in absentia for him. Another king succeeded Negus to the throne and another letter was sent to him by the Prophet [pbuh] but whether or not he embraced Islam is still a question not answered yet. [Sahih Muslim 2/99] And Only Allah Ta’ala Knows Best.